Earthquakes, floods, tsunamis, hurricanes, volcanoes--they stem from the same forces that give our planet life. Earthquakes give us natural springs; volcanoes produce fertile soil. It is only when these forces exceed our ability to withstand them that they become disasters. Together they have shaped our cities and their architecture; elevated leaders and toppled governments; influenced the way we think, feel, fight, unite, and pray. The history of natural disasters is a history of ourselves. In The Big Ones, leading seismologist Dr. Lucy Jones offers a bracing look at some of the world's greatest natural disasters, whose reverberations we continue to feel today. At Pompeii, Jones explores how a volcanic eruption in the first century AD challenged prevailing views of religion. She examines the California floods of 1862 and the limits of human memory. And she probes more recent events--such as the Indian Ocean tsunami of 2004 and the American hurricanes of 2017--to illustrate the potential for globalization to humanize and heal. With population in hazardous regions growing and temperatures around the world rising, the impacts of natural disasters are greater than ever before. The Big Ones is more than just a work of history or science; it is a call to action. Natural hazards are inevitable; human catastrophes are not. With this energizing and exhaustively researched book, Dr. Jones offers a look at our past, readying us to face down the Big Ones in our future. 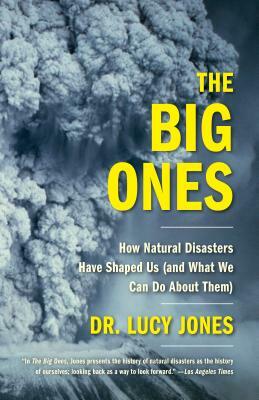 "The Big Ones is a timely and essential remembrance of how natural disasters have changed the world in dramatic ways. Lucy Jones is a first-rate storyteller and fine researcher."